Perfectly preserved after 43 years, the legendary Rumble in the Jungle's musical pre-show is a knockout in its own right. Kinshasa, 1974: Less than a decade after the coup d'état that saw military dictator Mobutu Sese Soko come into power in the country he renamed Zaire, one of the century’s greatest boxing matches -- The Rumble in the Jungle -- is about to rock the sporting world, pitting Muhammad Ali against George Foreman in a blockbuster fight on a global stage. It’s only right that such a hotly anticipated event be preceded by some of the decade’s top artists, and thus is born three-day concert Zaire 74, partially organized by Hugh Masekela. James Brown, Celia Cruz, Miriam Makeba, B.B. King... the list goes on and on, a melting pot of blazing funk and soul from both sides of the Atlantic. The 2009 documentary Soul Power would later bring the festival back into the public eye, but with a focus on the American artists. It’s taken 43 years for the original recordings of the African musicians’ sets to be released, but they’re here at last on Zaire 74: The African Artists, and they are well worth the unreasonable wait. 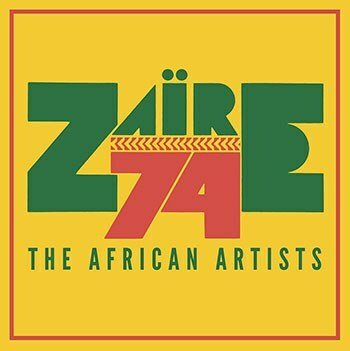 Zaire 74 scintillates from band Afrisa’s first brassy trills with a wide variety of popular music from the Congo and beyond, all full of glorious live energy. Soukous pioneer Tabu Ley Rochereau and band Afrisa lead the way with the first five tracks. Their sunny rock 'n' rumba combination is sharp, fast, and catchy, in sharp contrast to the jagged psychedelia that follows in two tracks by guitarist Abumba Masikini and a backing band. There, dizzying guitar solos grind through melancholy tunes, some of the album’s most compelling. His better-known sister, Abeti Masikini, follows with a mélange of traditional sounds, praise pieces for Mobutu, and frenzied rumba tunes. Her vocal delivery is unlike any other on the album; she growls, shrieks, and soars with raw, ever-evolving power. Both Masikini siblings are fearless, and theirs are songs that bring adventure into the Zaire 74 mix. The second disc showcases some more well-known artists. Franco and T.P.O.K. Jazz Orchestra make up the bulk of it with 11 tracks of Afro-Latin jazz. One of the more widely known groups of the lineup at the time, the Orchestra’s set is outstanding. If only these tracks had survived the years, it would still make for a fantastic album of dance music, stringing together Cuban big band sounds (as on "Koni Ya Bonganga") and more traditional sub-Saharan drum beats and chants (as on "Lala Nzala") in combination after fresh combination. Franco then introduces Miriam Makeba, who is in her finest form on four largely acoustic songs. "West Wind" is a moving highlight as Makeba sings of hope for peace and freedom over all of Africa. To picture this track in its original context -- sung in a nation newly free from bloody conflict, with the thought that the spotlight on Zaire from the Rumble could signify the start of a new and perhaps even prosperous chapter in the country’s heretofore troubled history -- gives it even more weight, and no voice of the time and place was better suited to carry that weight than the queenly Makeba. "Unify us," she sings over and over again, calling on Mobutu by name in an impassioned plea for love among all the people of Africa. "West Wind" is a blessing from Mama Africa herself, bringing the album to an emotional climax. After a lighter, brighter track from Makeba, jubilant pop music resumes at the capable hands and instruments of yé-yé group Orchestre Stukas, and the whole show closes with a final, exuberant number from the Pembe Dance Troupe. Though it’s mostly bells and chants, with the actual dance left to the imagination, the energy excites. What happens next, of course, is history. Ali wins the Rumble, and in spite of all the hopes for Zaire’s future, American-backed Mobutu reigns over the one-party state with an authoritarian fist until his exile in 1997, responsible for over three decades of human rights violations from which the Democratic Republic of the Congo has yet to recover. Perhaps all of this makes the sheer joy of the Zaire 74 shows even more important to preserve, and it is well-preserved indeed. The album’s sound quality is excellent, the music brilliant, and the spirits high. Wrasse Records has brought us not a dry historical document, but an old-school party the likes of which modern day music festivals can only aspire to. As the detailed booklet notes, what permeates every one of the vastly different sets of music on Zaire 74, what can be pulled from the Mobutu praise songs and tributes to Zairean national pride, is a sense of idealism that can’t be faked. That optimism mixed with infectious music makes for a stellar release decades later. It’s an even bigger knockout than the one that took down George Foreman.